I know I just broke some old Stadium Club a couple of boxes ago, but…….here’s more! This time I broke some from 1997, the debut year of the Co-Signers inserts. Maybe I’ll find one? Base set: The base set is comprised of 180 basic cards followed by 15 “TSC 2000” shortprinted youngstar cards, which are seeded one per jumbo pack. I pulled 115 basic cards (63.8% completion) with 46 doubles and 3 triples. I also pulled 12 different TSC 2000 shortprints including Scott Rolen, Andruw Jones, Todd Helton, and Nomar Garciaparra. Matrix (1:6 packs): Found at a rate of two per box, Matrix is a partial parallel which mirrors only a third of the base set. The first 60 cards of each series (numbers 1-60 and 196-255) are the only ones that are mirrored and the checklist is pretty solid. I pulled cards number 12 and 13 which feature Pedro Martinez and Jeff Bagwell respectively. I’m not really sure how to describe the technology used on these cards so I’ll let the scan do the talking. 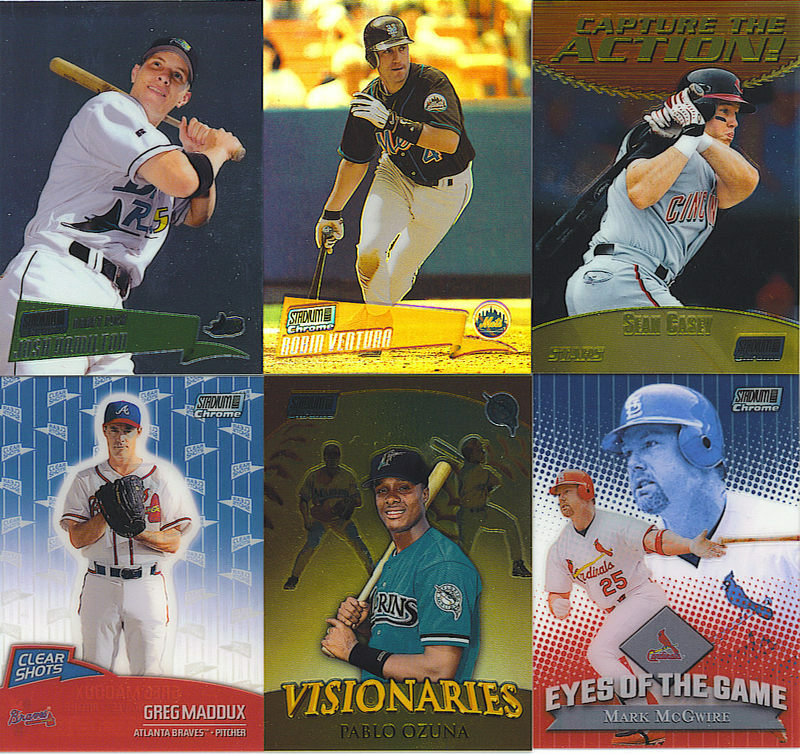 Millennium (1:12 packs): Most of the inserts found in 1997 Stadium Club can be found in both Series 1 AND Series 2. The Millennium insert set is one such example with 20 cards inserted into each series. The players in this set are all young stars/prospects whose images are embossed on an all-mirrorboard background. I pulled Justin Thompson, a former Tigers pitcher. Some other notables in the first series include Derek Jeter, Chipper Jones, Carlos Delgado, and Edgar Renteria. Just a warning, these cards seem to be easily damaged. Instavision (1:12 packs): Holograms! Who doesn’t love ’em? The Instavision inserts feature hologram images on a mock scoreboard that commemorate special moments from the 1996 season. My Barry Larkin card celebrates the fact that Barry became the first 30/30 shortstop in history that season. Some other moments celebrated in this set are the 20-strikeout game by Roger Clemens against Detroit and Derek Jeter’s infamous ALCS homer (a.k.a. The Jeffrey Maier home run), found in Series 2. Collation: C. The 49 doubles/triples are a bit high but seeing how that’s been the norm with these Stadium Club boxes, I was a little lenient with the grading. It was quite surprising not to hit any duplicates with the shortprints though. Also, the inserts delivered as promised so I can’t complain. Condition: B-. The condition was good overall, but there were a few issues with a couple base cards (luckily they were doubles) and the Millennium insert, which has a HORRENDOUS back. Pulls: B. There were some pretty solid names in this box. I was happy pulling the Larkin also as half the guys in the Instavision set are Mitchell Report guys. Value: B. Whether it’s a jumbo or regular hobby box, one should be able to find an unopened box of ’97 Stadium Club for about $20 or less. For that price, one could expect a healthy starter set with a dozen shortprints, a couple Matrix parallels, and at the very least two other inserts like the ones I pulled. Pure Gold (1 in 3 boxes) and Co-Signers (1 in 8 boxes) are also possible pulls. I basically got the minimum with this box but it was still an enjoyable break overall. Base set: The base set in Series 1 is comprised of 225 cards. The first 180 of these are the short set, which are followed by 45 Team SC shortprint cards. On the backs of these “TSC” cards, players were given a special productivity rating based how many at bats they needed to create a run. The formula used for this was as follows: At Bats/(RBI+Runs+HR). The top five at each position (including DH) could be found in this set. These cards were seeded one per pack and were exclusive to Series 1. In this box I pulled 125 basic short set cards and 24 different TSC cards, for 66.2%. Between duplicates, triples, and even some quads, the extras count reached 80. 80!!!! Before I move on, there’s one more look at some of the base cards. These are a few of my favorite horizontal photographs from the set, as well as TSC short prints of the 1994 MVP’s who were born on the same exact day in 1968. Revel in the awesomeness that is Stadium Club! Extreme Players: Now, I’ll explain the whole “extreme” concept I mentioned at the beginning. 180 total players (90 from each series) had an “extreme player” logo stamped on the front of their card. As you can tell from the scan, these logos were stamped in either bronze (1:12 packs), silver (1:24 packs), or gold foil (1:48 packs). How it Worked: Each of the “extreme players” were rated against one another based on a point system based on their final 1996 statistics. Players earned points based on these categories: home runs, RBI, stolen bases, batting average, wins, saves, and ERA. After season’s end, the top point-getter at each position, including both starting and relief pitcher, would be announced and if you held an “extreme player” card of any of the ten winners, you could redeem your card for a special prize. The prizes varied depending on which foil version of the winning card you owned. This box yielded Bronze cards of Mark Grace and Heathcliff Slocumb, a Silver Joe Girardi, and a Gold Todd Worrell. It just so happens that Todd Worrell was one of the ten winners so if I pulled this card back then, I could’ve redeemed it for the special Gold Prize of Mr. Worrell. Oh well, I’ll just toss this in the Night Owl pile. Mantle inserts (1:24 packs): Inserted at a one per box rate are a series of inserts paying tribute to the late Mickey Mantle. I know that many people are sick of seeing Mantle inserts, but I’m OK with these. These cards are fairly simplistic and the borderless photos look very good. Here a few other shots from this set. There are nine of these inserts found in packs of Series 1, one fewer than those found in Series 2. Prime Cuts (1:36 Hobby, 1:72 Retail): Found in every third retail box on average, the Prime Cuts inserts feature laser cut technology (similar to that year’s Topps Laser set) and gold foil over the player’s name and the word “CUTS.” The back of my Albert Belle card reveals the years in which Albert reached his then-career highs in stolen bases, RBI, home runs, and five other categories. Midsummer Matchups (1:48 Hobby, 1:24 Retail): It seems a bit strange that an insert would have more favorable retails odds than hobby, doesn’t it? That is just the case with the Midsummer Matchups inserts, found in every retail box but only every other hobby box on average. These dual-sided inserts feature the starters of the 1995 All-Star Game. The players are grouped together by the position they started in the game. These cards have a metallic finish to them and contain multiple ASG and league logos. Hideo Nomo occupies the front of this card while Randy Johnson can be found on the other. Megaheroes (1:48 Hobby, 1:24 Retail): The final insert of this box contains the same exact pack odds that the Midsummer Matchups do, and it’s called Megaheroes. With a rainbow foil finish and illustrative background, these cards look like something out of the Metal Universe line. My pull was of Ken Griffey, Jr. Several backgrounds in this set are unique to the player depicted on the card. For example, Roger Clemens has a rocket background and Andres Galarraga has a “big cat” background. Then, there’s this Deion Sanders card, which pays tribute to another pro team he played for. Collation: How many base cards (including SP’s) from my box came with at least one duplicate? FIFTY-FOUR PERCENT! Enough said. Grade: F. This is a major peeve of mine as I like to actually build sets from boxes I bust. Final Grade: B+. If it weren’t for the lousy collation, this box surely would’ve gotten an “A” for all the positives I just mentioned. I’m not the biggest set collector out there, but when I have a ton of cards from the same set laying around, I just have to go for it. And when trying to build a set, nothing drives me crazier than seeing the same damn cards in every other pack! Peeving dupes aside, this was still a very good box that shows how good Stadium Club can be when done right. P.S. Make sure you vote on the You Make the Call! post below and tell me what product you’d like to see busted here! EDIT: UD Timeline card numbers added. I thought this was a pretty good box. It was a nice surprise to pull the autograph, especially since it’s numbered to 99. I certainly can’t complain about that list of First Day cards either. If anyone’s looking for a certain card or set fillers, let me know. I don’t plan on building either set so send me your wantlists! As always, thanks for reading and good luck with your own breaks! Like many people in the blogosphere, I was a big fan of Stadium Club back in the day, for all the reasons mentioned here. Mr. Cracknell hit the nail on the head with that post and if you haven’t already, make sure you check the campaign link on my sidebar. Today I will review a Stadium Club product from its later years, a short-lived spinoff called Stadium Club Chrome. Base cards: There are 250 cards in the base set, the last 50 of which are young stars/prospects. In the regular Stadium Club set, these were shortprinted and seeded in every 5 packs. In the Chrome set, they are not. The cards feature the great photography SC is known for, with a colored pennant at the bottom of the card serving as a nameplate. One thing I did notice was that unlike most other chrome cards, these cards don’t curve nearly as much, which is a huge plus. I received 111 different base cards without any duplicates. Refractors (1:12 packs): There are 3 parallels to the base set, the most common being the Refractors. They are seeded 2 per box and look terrific, especially with the great photos. You can’t say enough about them! My 2 refractors were Robin Ventura and Randy Johnson. First Day Issue (1:33 packs): The second parallel I pulled was the good ol’ First Day Issue. These aren’t very easy to spot as the only difference between these and the regular cards are the words “First Day Issue” scrolling across the top of the pennant in very small print. The text is in gold and if you pull one of a player who has a yellow pennant on the card (like I did), they can be particularly hard to spot without flipping the card over and seeing the serial numbering on the back. These are limited to just 100. Unfortunately, my player was Keith Osik, who backed up Jason Kendall in Pittsburgh for years. If any Pirates fans out there want this, let me know. Also, there is a First Day Issue Refractor, numbered to just 25! Eyes of the Game (1:16 packs): Many of the insert sets in this product have very similar odds. Also, in similar fashion to the Bowman Chrome inserts I just reviewed, these also come with a rarer refractor parallel. The first insert is called Eyes of the Game, which is 1 of 2 acetate insert sets offered by SC Chrome. Each card has a transparent background with a close-up shot of the player’s stare. My pull was Mark McGwire. The stare in the background doesn’t compare to this Ken Griffey, Jr. The refractor version is found 1 in every 80 packs. Capture the Action (1:18 packs): This insert set has a mixture of stars, rookies, and legends, all with individual color themes on each card. I beat the odds here by pulling 2 of these – Mike Piazza and Sean Casey. The refractor version is found 1 in every 90 packs. Visionaries (1:18 packs): These are beautiful cards. Each card is predominantly gold with 2 smaller background images of the player against a baseball background. I pulled a Pablo Ozuna (I’ve been getting a lot of him!). The refractor version is found 1 in every 90 packs. I happened to pull a refractor of John Patterson, who is formerly of the D’Backs but currently with Texas. Clear Shots (1:24 packs): Here is acetate insert number 2. This insert set was featured on Things Done to Cards. These have the transparent background and a different color scheme for each player. Tons of small pennants saying “Clear Shots” can be found in the background while Greg Maddux stares in for the catcher’s sign in this pose. If you flip the card over, you can actually see the player’s back. I’m not sure that any other inserts out there have this trait. The refractor version is found 1 in every 120 packs. What WASN’T Pulled: Aside from the Visionaries insert, I didn’t pull any of the refractor versions of the inserts above. I also did not find a First Day Issue Refractor in my box. The stated odds on those are 1 in every 131 packs. Plus, there are only 25 of each so it doesn’t come as much of a surprise that I didn’t hit one. Final Thoughts: This box was a LOT of fun to rip. I enjoyed it even more than I thought I would! Everything I pulled looked great. The colors, photographs, and technology used made the cards memorable. Sure, there are no game-used or autographs to chase after, but so what? The inserts and parallels are all awesome and the base set is a very nice one to shoot for. It’s disappointing that SC Chrome only lasted for 1 year, but perhaps that’s what makes this underrated set so special (I’m sure I’m in the minority, but I actually liked this set). I’m definitely going to build the base set so expect another box of this on my blog soon! For barely over a dollar per pack, you can’t go wrong. Try one! As always, thanks for reading and good luck with your own breaks, new or old!